Oulu region belongs to the peatland richest region in Finland, where about 50% of land area is covered by peatlands. Large undrained aapa mires are however rare due to the intensive peatland forestry carried out during the past decades. The City of Oulu has a popular recreational area approximately 20 km from the City centre, where many mires are still in their pristine stage, and the peatlands used for forestry have been usually restored. Harakkalampi is a small mire protection area, which has rich flora and many threatened plant species. During this excursion different types of restored peatland ecosystems will be seen in Harakkalampi, such as spruce mires, rich fens and spring fens. 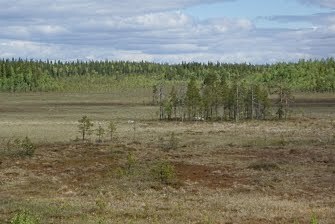 Pilpasuo is a large natural aapa mire protected through the Natura 2000 programme. Restored oligotrophic low-sedge fens will be seen on the margin of Pilpasuo. 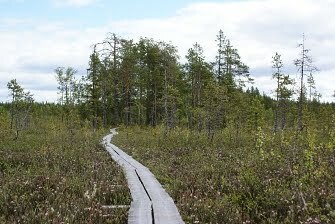 It is also possible to make a walk on Pilpasuo, which has a high variety of different mire types and rich bird life. Swamp fens and tall-sedge-fens are located on the central part of the mire, and various types of bogs on the peripheral part. Northern peatlands typically form a mosaic of mires and forests, which can be seen on the Nature Trail, which goes through the peatlands and forests in the area. There are boardwalks on a part of the trip, but rubber boots are highly recommended due to the crossing of the mires.